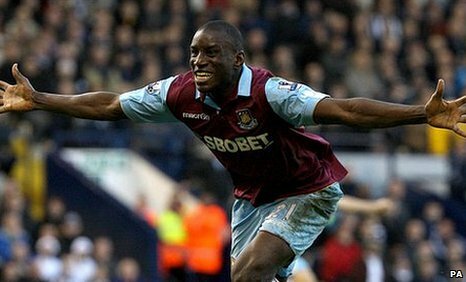 Demba Ba scored twice on his full debut as West Ham tenaciously fought back from three goals behind to earn a point at West Brom. Goals from Graham Dorrans, Jerome Thomas and a Winston Reid own goal gave the Baggies what looked like an unassailable 3-0 half-time lead. 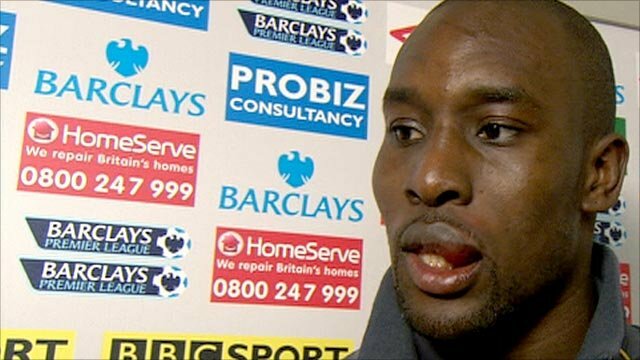 But a Ba double and a Carlton Cole header denied West Brom victory in front of their new boss Roy Hodgson. Both sides spurned late chances to win what was an enthralling contest. The Hodgson era got off to a flying start when, after just three minutes, Dorrans found space on the edge of the West Ham penalty area before unleashing an unstoppable rising drive beyond Robert Green. West Ham had barely recovered from Dorrans' stunning opener before Thomas had doubled the home side's lead. Thomas picked up Marc-Antoine Fortune's pass on the left wing, before bending the ball brilliantly inside the far post, taking full advantage of some woeful West Ham defending. But West Brom were rampant and their lead should have been stretched to three when Peter Odemwingie escaped the attention of Wayne Bridge from Mark Noble's corner, but could only find Green with his close-range header. West Ham thought they were back in the game when Cole latched onto Scott Parker's neat through-pass and found the back of the net but the striker was flagged offside, despite appearing to be level. It was end-to-end action as West Ham looked for a route back into the game but the clearer chances fell to the home side, who thought they should have had a penalty when the lively Thomas appeared to be pulled down in the box by Reid. But West Brom eventually made it three in the 32nd minute - and the hapless Reid was at fault again. Dorrans' free kick from the left caused yet more disarray in the penalty area, deflecting off Reid and into his own net. At 3-0, West Ham looked down-and-out but the Hammers showed glimpses of the brilliant comeback that was to follow, when Ba found space from Noble's corner only to see his shot expertly palmed onto the post by Boaz Myhill and eventually hacked off the line by James Morrison. Moments later, Gary O'Neil rattled the crossbar with Myhill beaten this time. But West Ham were not to be denied a goal back five minutes into the second half - taking advantage of the kind of questionable defending that was a feature of both side's play. Ba, making his first West Ham start following his move from Bundesliga side Hoffenheim, got the goal when he latched on to Noble's ball into the danger area and, under pressure from Paul Scharner, Ba chested the ball down and turned it in from close-range. The visitors capitalised on West Brom's vulnerability just eight minutes later when Carlton Cole threw himself at the ball inside the six-yard area. Despite picking up a head injury for his troubles, Cole's brave header set up a thrilling finale. Green kept West Ham in the match with an excellent save to his left after Odemwingie skipped away from two challenges before attempting to curl in from the edge of the box. That save proved as crucial as the second-half introduction of Frederic Piquionne, whose presence in attack further unsettled West Brom, who breathed again after the French striker's header crashed back off the bar. The three-man attack of Piquionne, Cole and Ba worked well for West Ham as the latter saw his shot from 12 yards cleared off the line after a jinking run by the influential Noble on the left. Just as it was looking as though the Baggies might hold on for an invaluable win in their quest for survival, Ba dashed those hopes with a well-taken equaliser. Jonas Olsson inadvertently flicked Noble's cross from the right into the path of Ba, who was waiting unmarked at the far post, to send an accomplished volley past Myhill. In a gripping finale, Piquionne blazed over and Odemwingie missed two decent chances to win the contest, ensuring West Ham climb off the foot of the table with this well-earned point. 96:11 The referee blows his whistle to end the game. 90:00+5:29 Effort on goal by Frederic Piquionne from just inside the penalty box goes harmlessly over the target. 90:00+4:23 Wayne Bridge sends in a cross. 90:00+4:02 Demba Ba fouled by Paul Scharner, the ref awards a free kick. Free kick taken by Mark Noble. 90:00+1:56 Inswinging corner taken right-footed by Mark Noble played to the near post, Close range header by Frederic Piquionne goes over the crossbar. 90:00+1:28 Peter Odemwingie takes a shot. Robert Green makes a save. 90:00+0:21 Unfair challenge on Paul Scharner by Carlton Cole results in a free kick. Direct free kick taken by Gonzalo Jara. 88:49 Peter Odemwingie takes a shot. Save by Robert Green. Correction - 87:48 Manuel da Costa takes a shot. Blocked by Paul Scharner. Wayne Bridge takes a inswinging corner from the right by-line to the near post. Jonathan Spector gives away a free kick for an unfair challenge on Gonzalo Jara. Direct free kick taken by Paul Scharner. 87:48 Paul Scharner takes a shot. Blocked by Chris Brunt. Wayne Bridge takes a inswinging corner from the right by-line to the near post. Gonzalo Jara fouled by Jonathan Spector, the ref awards a free kick. Paul Scharner restarts play with the free kick. 87:48 Booking Jonathan Spector receives a caution for unsporting behaviour. 85:03 Carlton Cole sends in a cross, Paul Scharner manages to make a clearance. 83:54 Chris Brunt takes the chance to get an effort at goal and missed to the left of the net. 82:33 GOAL - Demba Ba:West Brom 3 - 3 West Ham Demba Ba scores a goal from inside the box to the top left corner of the goal. West Brom 3-3 West Ham. 82:05 Short corner taken by Wayne Bridge. 81:23 Substitution (West Brom) makes a substitution, with Gabriel Tamas coming on for Graham Dorrans. 80:58 A cross is delivered by Scott Parker. 80:35 Short corner taken by Mark Noble. 79:27 Marc-Antoine Fortune sends in a cross. 78:59 Carlton Cole gives away a free kick for an unfair challenge on Chris Brunt. Nicky Shorey restarts play with the free kick. 78:27 Shot from just outside the box by James Morrison misses to the left of the goal. 77:20 Substitution (West Ham) makes a substitution, with Jonathan Spector coming on for Gary O'Neil. 75:42 Graham Dorrans takes the inswinging corner, free kick awarded for a foul by Giles Barnes on Robert Green. Robert Green takes the free kick. 75:26 Winston Reid gives away a free kick for an unfair challenge on Giles Barnes. Direct free kick taken by Peter Odemwingie. 72:38 The official flags Demba Ba offside. Free kick taken by Boaz Myhill. 70:26 Inswinging corner taken from the right by-line by Wayne Bridge, Manuel da Costa takes a shot. Boaz Myhill makes a save. 69:01 Peter Odemwingie takes a shot. Robert Green makes a save. Effort from deep inside the area by Demba Ba misses to the left of the target. 68:08 The assistant referee signals for offside against Peter Odemwingie. Free kick taken by Robert Green. 67:30 A cross is delivered by Scott Parker, save by Boaz Myhill. 66:55 The assistant referee signals for offside against Marc-Antoine Fortune. Free kick taken by Winston Reid. 65:37 Foul by Wayne Bridge on Giles Barnes, free kick awarded. Gonzalo Jara takes the free kick. 65:11 James Morrison takes a shot. Save by Robert Green. 64:39 Demba Ba takes a shot. Clearance made by Nicky Shorey. 64:13 The ball is crossed by Scott Parker, Paul Scharner makes a clearance. 61:53 Peter Odemwingie takes a shot. Robert Green makes a save. Outswinging corner taken right-footed by Graham Dorrans from the right by-line, Paul Scharner produces a header from close range which goes wide of the left-hand upright. 60:04 Gary O'Neil challenges Jerome Thomas unfairly and gives away a free kick. Direct free kick taken by Nicky Shorey. 60:04 Substitution Giles Barnes is brought on as a substitute for Jerome Thomas. 59:24 Frederic Piquionne takes a shot. 59:17 The ball is delivered by Wayne Bridge. 57:15 The assist for the goal came from Frederic Piquionne. 57:15 GOAL - Carlton Cole:West Brom 3 - 2 West Ham Carlton Cole grabs a headed goal from close in. West Brom 3-2 West Ham. 56:06 Chris Brunt gives away a free kick for an unfair challenge on Scott Parker. Mark Noble takes the direct free kick. 56:06 Substitution Frederic Piquionne is brought on as a substitute for Luis Boa Morte. 56:06 Booking The referee shows Chris Brunt a yellow card. 54:25 Carlton Cole is caught offside. Free kick taken by Boaz Myhill. 54:10 Free kick awarded for a foul by Paul Scharner on Demba Ba. Scott Parker restarts play with the free kick. 53:22 Jerome Thomas challenges Lars Jacobsen unfairly and gives away a free kick. Manuel da Costa restarts play with the free kick. 50:59 Unfair challenge on Winston Reid by Marc-Antoine Fortune results in a free kick. Free kick taken by Robert Green. Wayne Bridge crosses the ball, clearance made by Chris Brunt. Corner from the right by-line taken by Mark Noble, Luis Boa Morte takes a shot. Boaz Myhill makes a save. 49:57 Mark Noble provided the assist for the goal. 49:57 GOAL - Demba Ba:West Brom 3 - 1 West Ham Demba Ba scores a goal from inside the six-yard box low into the middle of the goal. West Brom 3-1 West Ham. 48:43 A cross is delivered by Jerome Thomas, Winston Reid manages to make a clearance. 48:02 Free kick awarded for a foul by Winston Reid on Peter Odemwingie. Paul Scharner takes the direct free kick. 45:00+4:50 The whistle is blown to end the first half. Correction - 45:00+2:52 Gary O'Neil takes a shot. Demba Ba takes a shot. Blocked by Graham Dorrans. Inswinging corner taken by Mark Noble from the right by-line, Manuel da Costa takes a shot. Save by Boaz Myhill. 45:00+2:52 Gary O'Neil takes a shot. Demba Ba takes a shot. Graham Dorrans gets a block in. Mark Noble takes the inswinging corner, Winston Reid takes a shot. Save made by Boaz Myhill. 45:00+0:01 Jerome Thomas has an effort at goal from outside the area missing to the wide right of the target. 44:28 The offside flag is raised against Demba Ba. Boaz Myhill restarts play with the free kick. 43:15 Corner taken by Graham Dorrans, save by Robert Green. 43:04 Graham Dorrans takes a shot. Save by Robert Green. Correction - 40:33 Inswinging corner taken right-footed by Mark Noble from the left by-line. Demba Ba takes a shot. Save made by Boaz Myhill. 40:33 Inswinging corner taken from the left by-line by Mark Noble. Effort from inside the six-yard area by Demba Ba hits the post. 38:45 Mark Noble gives away a free kick for an unfair challenge on Graham Dorrans. Jonas Olsson restarts play with the free kick. 38:45 Booking Mark Noble goes into the book. 36:23 Unfair challenge on Scott Parker by Paul Scharner results in a free kick. Free kick taken by Scott Parker. 33:57 Free kick awarded for an unfair challenge on Jerome Thomas by Manuel da Costa. Graham Dorrans takes the free kick. 31:28 Assist by Graham Dorrans. 31:28 GOAL - Winston Reid:West Brom 3 - 0 West Ham Winston Reid puts the ball into his own goal. West Brom 3-0 West Ham. 30:51 Foul by Scott Parker on Jerome Thomas, free kick awarded. Graham Dorrans takes the direct free kick. 30:20 James Morrison sends in a cross, clearance by Manuel da Costa. 29:23 Chris Brunt fouled by Luis Boa Morte, the ref awards a free kick. Direct free kick taken by Chris Brunt. 29:23 Booking Booking for Luis Boa Morte. 28:32 Booking The referee shows Graham Dorrans a yellow card. 28:00 Gary O'Neil takes a shot. Save by Boaz Myhill. 25:47 Luis Boa Morte fouled by James Morrison, the ref awards a free kick. Scott Parker takes the direct free kick. 24:46 Manuel da Costa takes a shot. Boaz Myhill makes a comfortable save. 23:59 Gary O'Neil fouled by Graham Dorrans, the ref awards a free kick. Mark Noble takes the free kick. 22:26 The offside flag is raised against Carlton Cole. Boaz Myhill restarts play with the free kick. 20:40 Carlton Cole produces a left-footed shot from just outside the area that goes wide left of the goal. 20:15 Inswinging corner taken left-footed by Wayne Bridge played to the near post, clearance made by Paul Scharner. 16:27 Corner taken by Graham Dorrans, Peter Odemwingie takes a shot. Comfortable save by Robert Green. 14:40 Foul by James Morrison on Wayne Bridge, free kick awarded. Demba Ba takes the direct free kick. 13:33 Gary O'Neil challenges Nicky Shorey unfairly and gives away a free kick. Direct free kick taken by Nicky Shorey. 13:33 Substitution James Morrison is brought on as a substitute for Youssouf Mulumbu. 8:34 The ball is delivered by Nicky Shorey, save made by Robert Green. 7:06 Marc-Antoine Fortune provided the assist for the goal. 7:06 GOAL - Jerome Thomas:West Brom 2 - 0 West Ham A goal is scored by Jerome Thomas from just inside the area to the bottom right corner of the goal. West Brom 2-0 West Ham. 5:03 Chris Brunt gives away a free kick for an unfair challenge on Luis Boa Morte. Free kick taken by Mark Noble. 4:18 Peter Odemwingie takes a shot. Save made by Robert Green. 2:47 Assist by Peter Odemwingie. 2:47 GOAL - Graham Dorrans:West Brom 1 - 0 West Ham Graham Dorrans scores. West Brom 1-0 West Ham. 1:06 Marc-Antoine Fortune takes a shot. Save by Robert Green. Youssouf Mulumbu challenges Luis Boa Morte unfairly and gives away a free kick. Scott Parker restarts play with the free kick. 0:21 Mark Noble concedes a free kick for a foul on Gonzalo Jara. Free kick taken by Paul Scharner.